I got my copy of The Bad Beginning when I saw a small book with ragged pages and a cloth covered spin and fell in love with it. Not only with the binding but also with the stories. 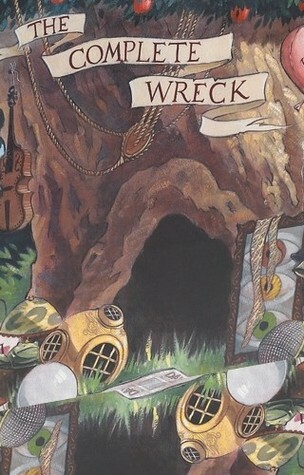 I gave The Complete Wreck by Lemony Snicket 3 out of 5 stars. This is my combined rating for every single part divided by 15. But I did like it a lot. My main problem with the serie was, and this may be a failure of mine, that I expected that over 15 novels the three Baudelaire children would actually have any development. Yes they are children and the things that happen in these books, are not their fault. But they could have changed something to save themselves. The End was also not really satisfying and this bothered me too. The children grew up and cared for a baby? What is that for an ending? How can a child care for a child? This bothered me a lot as one can see. As I say, this might all be a failure of mine, since I am an adult by now and had never read these during my youth. But I do think these books are amazing for young readers, the target audience. The books are funny and even though they tell miserable tales, Lemony Snicket makes you have fun through them. Every book is different and has small hidden references in them to the other books. I do think the books have a very interesting premise, which was what kept me reading. This entry was posted in Book Review and tagged Adventure, Drama, Fantasy, Lemony Snicket. Bookmark the permalink.